Churn Dash Christmas Lap Quilt 48 x 60"
Another finish to share today! This is the Churn Dash Christmas Quilt I made using 9 red on white background churn dash blocks from the October block of the month at the Proper Bostonian Quilters Guild. The cat is the "disruption" in this quilt. Once the quilt was pieced, that mostly white block didn't read very well in a row of mostly white churn dash blocks. It appeared to extend into the block above it and the block below. I figured the quilting could improve it, and that's exactly what happened. I quilted around the margins of the cat block and quilted concentric circles around the cat. The inner circle is quilted with dark green thread and the next to last circle is quilted with very pale green. Most of the thread used for quilting is a very light silver/grey color. That grey looked much better white on the quilt's red back. The batting in this quilt is wool. Perfect for cold Yule Season nights. The binding is a peppermint candy print fabric! I love peppermint! Here is my "Floral Latte", low volume plus sign quilt design, finished top. "Disruption" in pattern to create more interest has been my theme this fall. In this quilt the disruption is in the 3rd vertical column of block from the left. All the blocks in the horizontal rows are the same block. But in the 3 vertical row, it's the opposite block. I also added the narrow orchid strip and a plain border just on the left side of the quilt. I tried out lots of various layouts on my design wall--but this is the layout that I found the most interesting and the most pleasing! I left the background in the photo this time--I like how the autumn color in the trees and the leaves on the ground compliment this quilt! And speaking of compliments...a shout out to my friend Suzanne for giving me the inspiration for this quilt's name! Thanks! 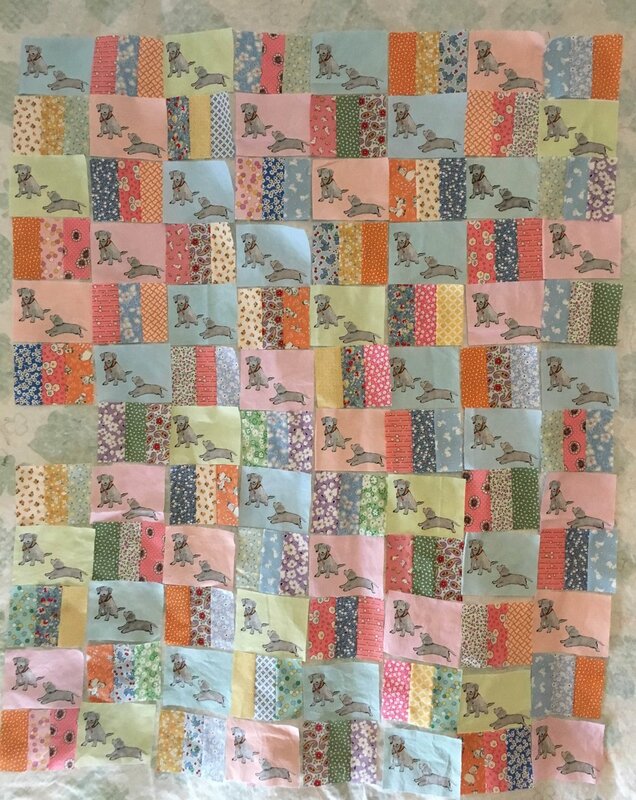 In my last post I discussed how I decided on the layout for my Lab Puppies Quilt. In this post we'll look at the assembly of the quilt and I'll discuss my decisions about the quilt's borders. The photo above shows the quilt in the assembly process. At the top is a section of the completed top. Below that are 4 rows of blocks which have been sewn together. Under the completed strips are cut patches waiting for their turn at a the sewing machine. At the very bottom a possible layout for a border. My rail fence strips were cut from 10 inch precut squares. The dog blocks are 4 inches high so I was able to cut 2 rail fence block from each strip set. And 2 inches of pieced strips were "waste". Right. No quilter really likes to toss anything she (he) spent time carefully piecing. I cut the rail block remnants into 1 3/4 inch x 4 inch strips and turned them to sew them end-to-end, making a narrow pieced border strip. The strips of solids were left after I cut the 4 inch patches from the solid 10" precut squares. The pieced quilt top was just 38 1/2 inches wide. That's narrow, so I decided to add more solid rectangles to the left side of the quilt to make the quilt 42 inches wide. To continue the "disruption" I discussed in my previous post I did two things. I ran the right border to the bottom of the pieced quilt top. I sewed that border on first. Then I added the bottom 3 borders which run the width of the now wider quilt top. I added one block with a single Labrador from another fabric in my Black Labrador Puppies line! I hope you enjoyed seeing how I worked through the process of creating the original Lab Puppies quilt pattern. I have a tendency to show a block or a stack of fabrics and the next time that project appears it is finished quilt top or a completed quilt. How a design actually becomes to a quilt remains a mystery! So I thought I'd walk you through the design process for my Lab Puppies quilt. I had fat quarters of my Lab Puppies fabric in 5 colors. I found I could fussy cut the pair of dogs into patches 5 inches wide and 4 inches high without "wasting" any of the printed dogs. I also had 2 stacks of 10 inch precuts. One stack was 1930s reproduction fabrics and the other was solid colors which coordinate with 1930's fabrics. They were in my stash, purchased previously from Keepsake Quilting. I decided to alternate my dog blocks with pieced rail fence blocks, with strips cut from the patterned '30s fabrics. Here is my original layout on my design wall (the fuzzy side of a picnic tablecloth). It was nice. Nothing wrong with it--just not exciting. I gave myself a time-out see if an idea for better layout surfaced. I decided to sit down and watch Lisa Congdon's Creativebug class, More Sketchbook Explorations. During the video of the first chapter she commented that the eye prefers a "little bit of disruption in the overall composition." BINGO! I literally shot out of my chair and went to the cutting table. 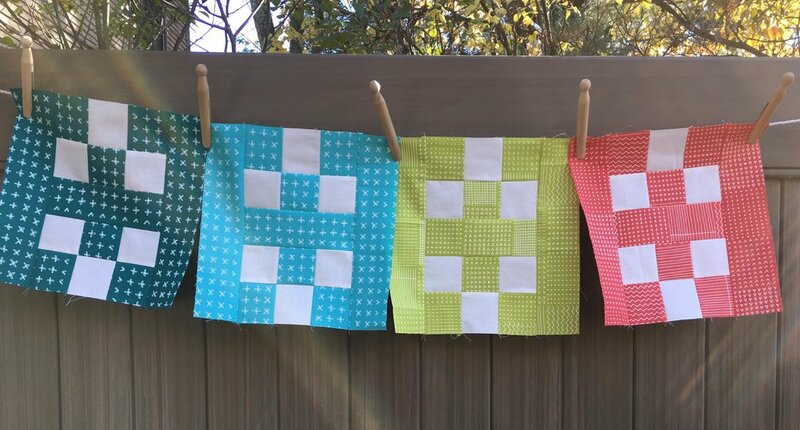 I cut 4 inch squares out of the stack of solid '30s colors. I randomly placed a single solid color block next to a dog block in each row of the quilt. The random block create a much more interesting design!! My eye recognized the disruption but only the purple solid square really stood out. I had to really look to find the solid patches in the other rows! I love the "cross-pollination" between different genres. A drawing/doddling class provided the idea for the the "distrupted" layout which made a better quilt design! In my next post I'll discuss my unconventional borders.